California Republican Seeks Recount in O.C. A California state senator who narrowly lost her re-election bid is requesting a partial recount of ballots in Orange County, the county’s elections chief, Neal Kelley, announced Thursday. Former Republican Sen. Janet Nguyen requested the recount on Tuesday, a day after Democrat Tom Umberg was sworn in to replace her. A voter in Senate District 34, on behalf of Nguyen, originally requested a complete recount of votes in Orange County, which comprises the vast majority of the district. Kelley said the request was later scaled back to 12 precincts in Santa Ana. A minor change in California’s election laws may have had a major effect on last month’s midterm elections that saw Democrats steamroll their Republican rivals and claim all but seven of the Golden State’s 53 House seats. Despite holding substantial leads on Election Day, many Republican candidates in California saw their advantage shrink, and then disappear, as late-arriving Democratic votes were counted in the weeks following the election. While no hard evidence is available, many observers point to the Democrats use of “ballot harvesting” as a key to their success in the elections. “Anecdotally there was a lot of evidence that ballot harvesting was going on,” Neal Kelley, the registrar for voters in Southern California’s Orange County, told Fox News. The megapolis on California’s southern coast stretches from Ventura County on the northern end, through Los Angeles County, Orange County, down to San Diego County on the border with Mexico. It also includes the western portions of Riverside and San Bernardino counties. Altogether these six counties have a population of 20.5 million residents. According to the California Department of Water Resources, urban users consume 3.7 million acre feet of water per year, and the remaining agricultural users in this region consume an additional 700,000 acre feet. Much of this water is imported. In an average year, 2.6 million acre feet of water is imported by the water districts serving the residents and businesses in these Southland counties. The 701 mile long California Aqueduct, mainly conveying water from the Sacramento River, contributes 1.4 million acre feet. The 242 mile long Colorado River Aqueduct adds another 1.0 million acre feet. Finally, the Owens River on the east side of the Sierras contributes 250,000 acre feet via the 419 mile long Los Angeles Aqueduct. Californians have already made tremendous strides conserving water, and the potential savings from more stringent conservation mandates may not yield significant additional savings. Population growth is likely to offset whatever remaining savings that may be achievable via additional conservation. Meanwhile, the state mandated water requirements for California’s ecosystems continue to increase. The California State Water Board is finalizing “frameworks” that will increase the minimum amount of flow required to be maintained in the Sacramento and San Joaquin rivers order to better protect fish habitat and reduce salinity in the Delta. 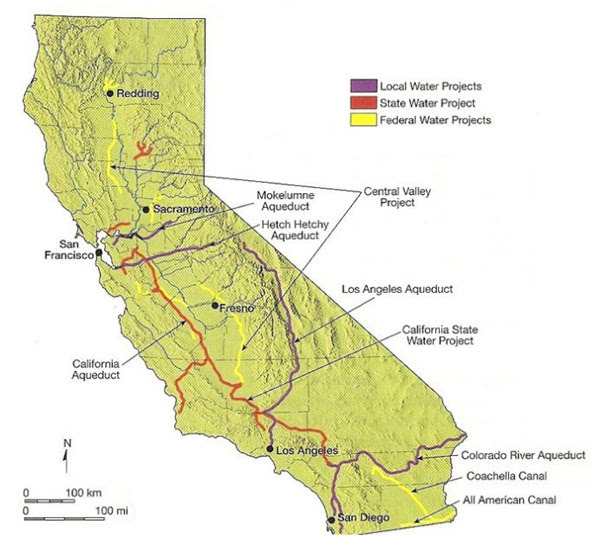 And, of course, these rivers, along with the Owens and Colorado rivers, are susceptible to droughts which periodically put severe strain on water users in California. At about the same time, in 2015, California’s legislature began regulating groundwater withdrawals. This measure, while long overdue, puts additional pressure on urban and agricultural users. California’s water requirements for healthy ecosystems, a robust and growing farm economy, as well as a growing urban population, are set to exceed available supply. Conservation cannot return enough water to the system to fix the problem. How Can Water Supplies Increase? In Southern California, runoff capture is an option that appears to have great potential. Despite its arid climate and perennial low rainfall, nearly every year a few storm systems bring torrential rains to the South Coast, inundating the landscape. Until the Los Angeles River was turned into a gigantic culvert starting in 1938, it would routinely flood, with the overflow filling huge aquifers beneath the city. Those aquifers remain, although many are contaminated and require mitigation. Runoff harvesting for aquifer storage represents one tremendous opportunity for Southern Californians to increase their supply of water. The other possibilities are sewage recycling and desalination. In both cases, Southern California already boasts some of the most advanced plants in the world. The potential for these two technologies to deliver massive quantities of potable water, over a million acre feet per year each, is now predicated more on political and financial considerations than technological challenges. Orange County leads the United States in recycling waste water. The Orange County Sanitation District treats 145,000 acre feet per year (130 million gallons per day – “MGD”), sending all of it to the Orange County Water District’s “Ground Water Replenishment System” plant for advanced treatment. The GWRS plant is the biggest of its kind in the world. After being treated to potable standards, 124,000 acre feet per year (110 million GPD), or 85 percent of the waste water, is then injected into aquifers to be stored and pumped back up and reused by residents as potable water. The remainder, containing no toxins and with fewer total dissolved solids than seawater, is discharged harmlessly into the ocean. Currently the combined water districts in California’s Southland discharge about 1.5 million acre feet (1.3 billion GPD) of treated wastewater each year into the Pacific Ocean. Only a small percentage of this discharge is the treated brine from recycled water. But by using the advanced treatment methods as are employed in Orange County, 85% of wastewater can be recycled to potable standards. This means that merely through water reuse, there is the potential to recycle up to another 1.2 million acre feet per year. Needless to say, implementing a solution at this scale would require major challenges to be overcome. Currently California’s water districts are only permitted to engage in “indirect potable reuse,” which means the recycled water must be stored in an aquifer or a reservoir prior to being processed as drinking water and entering the water supply. By 2023, it is expected the California Water Board will have completed regulations governing “direct potable reuse,” which would allow recycled water to be immediately returned to the water supply without the intermediate step of being stored in an aquifer or reservoir. In the meantime, it is unlikely that there are enough uncontaminated aquifers or available reservoirs to store the amount of recycled water that could be produced. The other source of new water for Southern California, desalination, is already realized in an operating plant, the Carlsbad Desalination Plant in San Diego County. This plant produces 56,000 acre feet per year (50 MGD) of fresh water by processing twice that amount of seawater. It is the largest and most technologically advanced desalination plant in the Western Hemisphere. It is co-located with the Encina Power Station, a facility that uses far more seawater per year, roughly ten times as much, for its cooling systems. The Carlsbad facility diverts a portion of that water for desalination treatment, then returns the saltier “brine” to the much larger outflow of cooling water at the power plant. Objections to desalination are many, but none of them are insurmountable. The desalination plant proposed for Huntington Beach, for example, will not have the benefit of being co-located with a power plant that consumes far more seawater for its cooling system. Instead, this proposed plant – which will have the same capacity as the Carlsbad plant – will use a large array of “wet filters” situated about 1,500 feet offshore, on the seabed about 40 feet below the surface, to gently intake seawater that can be pumped back to the plant without disrupting marine life. The outgoing brine containing 6 percent salt (compared to 3% in seawater) will be discharged under pressure from an underwater pipe extending about 1,800 feet offshore. By discharging the brine under pressure, it will be instantly disbursed and immediately dissipated in the powerful California current. While desalination is considered to be energy intensive, a careful comparison of the energy cost to desalinate seawater reveals an interesting fact. It takes a roughly equivalent amount of electricity to power the pumps on the California aqueduct, where six pumping stations lift the water repeatedly as it flows from north to south. To guarantee the water flows south, the California aqueduct is sloped downward by roughly one foot per mile of length, meaning pump stations are essential. The big lift, of course, is over the Tehachapi Mountains, which is the only way to import water into the Los Angeles basin. The technological barriers to large scale implementation of water recycling and desalination, while significant, are not the primary impediments. Permitting and financing are far bigger challenges. Moreover, financing costs for these mega projects become more prohibitive because of the difficulties in permitting. The process necessary to construct the proposed Huntington Beach Desalination Plant is illustrative of just how difficult, if not impossible, it is to get construction permits. The contractor has been involved in the permitting process for 16 years already, and despite significant progress to-date, still expects approval, if it comes, to take another 2-3 years. One of the problems with permitting most infrastructure in California is that several agencies are involved. These agencies can actually have conflicting requirements. Applicants also end up having to answer the same questions over and over, because the agencies don’t share information. And over the course of decades or more, the regulations change, meaning the applicant has to start the process over again. Compounding the difficulties for applicants are endless rounds of litigation, primarily from well-funded environmentalist organizations. The failure to-date of California’s lawmakers to reform CEQA make these lawsuits potentially endless. Even if permitting were streamlined, and all technical challenges were overcome, it would be a mistake to be glib about financing costs. Based on the actual total cost for the Carlsbad desalination plant, just under $1.0 billion for a capacity of 56,000 acre feet per year, the capital costs to desalinate a million acre feet of seawater would be a daunting $18.0 billion. On the other hand, with permitting reforms, such as creating a one-stop ombudsman agency to adjudicate conflicting regulations and exercise real clout among the dozens of agencies with a stake in the permitting process, billions could be shaved off that total. Similarly, CEQA reforms could shave additional billions off the total. How much could be saved? The Sorek desalination plant, commissioned in Israel in 2015, cost $500 million to build and desalinates 185,000 acre feet of water per year. Compared to Carlsbad, Sorek came online for an astonishing one-sixth the capital cost per unit of capacity. While there’s undoubtedly more to this story, it is also undeniable that other developed nations are able to deploy large scale desalination plants at far lower costs than here in California. Financing costs for water recycling, while still staggering, are (at least in California) not comparable to those for desalination. The GWRS water recycling plant in Orange County was built at a capital cost of $905 million – $481 million was the initial cost, the first expansion cost $142 million, and the final expansion cost $282 million. This equates to a capital cost of $7,300 per acre foot of annual yield. If that price were to apply for new facilities to be constructed elsewhere in the southland, one million acre feet of recycling capacity could be built for $7.3 billion. Until there is direct potable reuse, however, it would be necessary to add to that cost the expense of either constructing storage reservoirs, or decontaminating aquifers for underground storage. While runoff capture, water recycling, and desalination have the potential to make Southern California’s coastal megapolis water independent, it will take extraordinary political will and innovative financing to make it happen. The first step is for California’s voters and policymakers alike to recognize that conservation is not enough, that water supplies must be increased. Once the political will is established, it will be necessary to streamline the regulatory process, so cities, water agencies, and private contractors can pursue supply oriented solutions, at realistic prices, with a reasonable certainty that their applications will be approved. Edward Ring co-founded the California Policy Center and served as its first president. This article originally appeared on the website of the California Policy Center. Once coveted as a conservative bastion in liberal California, Orange County has become a last stand for the state’s Republicans. Chased out of much of California by Democrats who hold every statewide office and a 39-14 advantage in U.S. House seats, the state’s GOP is trying to hold its ground in a historically Republican stronghold. My Administration stands in solidarity with the brave citizens in Orange County defending their rights against California's illegal and unconstitutional Sanctuary policies. California's Sanctuary laws…. Opposition in Orange County from government bodies to the state’s sanctuary law could serve as a sign of the electorate’s mood and just might influence the hotly contested Orange County congressional races. This resistance to the resistance – the state resisting the federal government, the locals resisting the state – comes against the background of Democratic efforts to take back the House of Representatives. Intense efforts are being made to flip congressional seats in Orange County in which Hillary Clinton outpolled Donald Trump. The state legislature passed and the governor signed SB 54, the sanctuary state law, which blocks local law officials from working with federal immigration enforcement officers in certain situations. The Trump Administration has challenged the sanctuary state and sanctuary city laws in court. This week, a number of states with Republican governors filed briefs in support of the Administration’s position. After the city council of Los Alamitos in Orange County voted to oppose the sanctuary state law, other Orange County communities and the county supervisors considered actions to oppose the state law, with the county voting to join a federal lawsuit against the sanctuary laws. Hints on how this issue might play in the coming congressional elections could be gleaned from polling done by the Public Policy Institute of California. The Orange County districts targeted by the Democrats are Congressional District (CD) 39 currently held by Ed Royce (who is retiring), CD 45 held by Mimi Walters and CD 48, Dana Rohrabacher – Republicans all. CD 39, which sits about 60% in Orange County with the remainder in Los Angeles and San Bernardino Counties, has a plurality of Republican registered voters, but barely, 1.5% more than Democrats. CD 45 and CD 48, both completely within the boundaries of Orange County, have 8% and 11% Republican registration leads over Democrats, respectively. Last May, PPIC asked likely voters if they supported or opposed the then-proposed sanctuary state law. 43% favored the law; 48% opposed the idea. While Democrats were in favor of the proposal by a 2 to 1 margin, Republicans were opposed by nearly 4 to 1. In the PPIC survey last month, likely voters were asked if they thought if the federal crackdown on undocumented immigrants is a good thing or a bad thing. In the Republican leaning districts, 61% said it was a good thing, 34% thought it was a bad thing. With local elected officials standing up on the side that the polling seems to indicate likely voters in the district support, this could be a positive sign for those hoping the contested districts will remain in Republican hands. How California goes in the coming mid-term elections in the challenged races very well could determine who controls Congress in January. Joel Fox is editor and co-publisher of Fox and Hounds Daily. President Trump on Wednesday cheered a decision by officials in Orange County, Calif., to join a federal lawsuit seeking to block California’s so-called sanctuary laws. “My Administration stands in solidarity with the brave citizens in Orange County defending their rights against California’s illegal and unconstitutional Sanctuary policies,” Trump tweeted. “California’s Sanctuary laws release known dangerous criminals into communities across the State. All citizens have the right to be protected by Federal law and strong borders,” he added. More California cities may consider defying the state’s “sanctuary state” laws, after the city council of Los Alamitos passed an ordinance defying the state’s controversial new legislation preventing cooperation with federal immigration authorities. Orange County is a key battleground in 2018, both at the state and federal levels. Democrats are hoping to pick up several U.S. House seats in the county, which voted for Hillary Clinton in 2016 — the first time in decades that the traditionally conservative county had backed a Democrat. But Republicans are backing a recall of State Sen. Josh Newman (D-Fullerton) for voting to raise the gas tax. A ballot initiative to repeal the gas tax hike could also bring Republicans out to vote. And the immigration issue is likely to fuel turnout even more. Proponents of the Los Alamitos legislation argued that the state was forcing local officials to defy their oath to the Constitution, and that the new ordinance was faithful to the rule of law. When do We Finally Say ‘No’ to Tolerating the Damage and Chaos of Homelessness? What’s the best way for a free country to make decisions about how to spend tax money? One way to do it is to hold elections to choose public officials who will make decisions on behalf of the people who elected them, then hold a fully public process to create budgets and appropriate the money that taxpayers are required to hand over. Another way to do it is to find the people in society who are totally unable to manage their own lives and put them in charge of public spending. That’s how we do it in California. Our government at all levels has accepted the argument that the moment people self-identify as having “nowhere else to go,” they acquire a civil right to pitch a tent and live on public property an ywhere, including streets, sidewalks, plazas, parks, stormwater channels and freeway embankments. Then it’s your responsibility as a taxpayer to pay whatever it costs to mitigate the damage and clean up the chaos. The cost is rapidly becoming incalculable, from the $17 million needed by the L.A. Bureau of Sanitation for homeless encampment cleanups, to the staggering damage from wildfires caused by cooking in the midst of dry brush, to the catastrophic toll of a hepatitis A epidemic that took 20 lives in San Diego and put hundreds of people in the hospital. Taxpayers in Orange County are paying for month-long motel vouchers for hundreds of people as the price of reclaiming the intended public use of the Santa Ana River trail. It’s not clear what will be different in a month, but that was the deal reached in the courtroom of U.S. District Judge David O. Carter. He was involved because attorneys for seven homeless people filed a federal lawsuit alleging that their civil rights were violated by the eviction from the huge encampment. Judge Carter personally walked the river trail with county and city officials to see the problem first-hand, and he acknowledged that the offer of shelter would be rejected by many. “Some who want to wander will wander,” he said. And that’s federal law now, if you’re wondering how we got where we are today. No matter how much money we choose to spend on services or housing — and the tax increases are stacking up — the public has no right to demand that people get off the streets. We’ll pay for the services and housing and still have to pay for the damage and the chaos. Eventually some city or county official will have the courage to reject a settlement in one of these lawsuits, and he or she will fight all the way to the Supreme Court in defense of the public’s right to preserve public spaces for their intended use. Who’s Really to Blame for Orange County’s Housing Affordability Crisis? This past week, three separate media outlets sought my comment on Orange County’s housing affordability crisis and high-cost of living. The inquiries came on the heels of a host of news stories chronicling sky-high rents, the dismantling of homeless encampments in Anaheim, and the adequacy of wages paid by the county’s largest employers. These were the questions news folks wanted answered: What is business doing to get more homes built? What is business doing to eliminate poverty? What is business doing to end homelessness? Do we face a growing housing affordability and cost-of-living crisis here in Orange County and throughout California? You bet. Hardworking residents are struggling to make ends meet, and housing costs stand at the center of their paycheck-to-paycheck existence. Orange County Business Council has been arguing this for years and objective data backs it up. A recent USC Gasden Family Forecast shows the average rent for a two-bedroom apartment in Orange County at a whopping $1,813 a month. For the typical renter, that’s a number that swipes more than half of their monthly take-home pay. But the problem isn’t a lack of quality jobs or even skimpy paychecks. The problem is a lot of workers in a strong economy chasing too few available homes or apartments. That drives up housing costs and takes more of their paycheck. Indeed, OCBC’s own Housing Scorecard reports that Orange County needs 65,000 more homes today to meet the housing needs of the people who already live and work here. But get this: Orange County has added only one new home for every 5.26 residents since 2010. And it’s not just Orange County that’s falling down on the job. Anaheim reportedly approved only 8 percent of its low-income housing needs, for example. The crisis statewide is even more pronounced. A recent report found that more than 500 counties and cities failed to meet their mandated housing goals. So it’s no wonder that California has a housing shortage exceeding 3.5 million homes. That’s what you get when your population has increased every year since 1950, but you’ve failed every year since 1989 to build enough homes to meet the need. Homebuilders — in an industry that has fueled California’s economy for more than half a century — are as eager as ever to build the American Dream in the Golden State. But here’s the problem: lawmakers, regulators, local governments and anti-development activists — who already own their own home — won’t let them. Overly restrictive land-use regulations, abuses of California’s environmental laws, local ballot box initiatives that neuter good planning, and city councils that won’t say “yes” are fueling the bottleneck in new-home delivery. Sure, some recent, minor actions were taken by the state legislature to streamline approvals, but ultimately local political leadership controls land use and housing decisions. The systemic flaws that eat away at the paychecks of Orange County residents and threaten California’s economic prosperity are not caused by business but by the folks you elect to serve you in public office. The role of business is to offer goods and services, and thus create jobs, not to act as a substitute for local government or its elected officials who benefit from the significant tax revenue generated by business. So here are the questions that need to be asked: What are your elected leaders doing to see that a good supply of affordable housing is built? What are your elected leaders doing to assure the end of homelessness in your community? What are your elected leaders doing to help grow good middle class jobs? If you don’t like the answers, vote them out. Originally published in the Orange County Register. Should California Deputies at the Vegas Shooting Get Worker’s Comp? The Orange County deputy sheriffs’ union president, in a recent interview with the Orange County Register, made a shockingly cynical statement about the men and women he represents. His words probably were meant as a rhetorical device to muscle county taxpayers into paying some controversial workers’ compensation claims, but I was nonetheless floored by what Tom Dominguez was quoted saying. Dominguez was referring to four unnamed county deputies who attended country singer Jason Aldean’s Oct. 1 concert in Las Vegas, where a gunman murdered 59 people and injured 527 others. The deputies were on their personal time and were in Clark County, Nevada, not Orange County, California, yet they argue that California residents should pay for their physical and psychological injuries. Orange County this week rejected the request, but it’s likely to end up in court. Other counties and cities also are dealing with the same issue, according to the newspaper. Like most government employees, Orange County deputy sheriffs receive extremely generous medical, sick leave, disability and vacation benefits. Their injuries should be covered given that they weren’t at the concert for work. But these deputies seek the extra benefit of workers’ compensation, which preserves their accumulated leave and allows longer periods of paid time off. The newspaper didn’t have details of the particular claims, but noted that “several Orange County deputies at the Route 91 Harvest festival quickly assumed life-saving roles—protecting the perimeter of the area with a shotgun in one case and administering medical care in other instances.” When the shooting began, they used their skills to help out. They deserve to be applauded for their efforts in such a tense situation. Good for them. The policy question, however, is whether deputies behaving as they are trained to behave opens a treasure-trove of work-related benefits—even if they were in a non-work situation in another county and neighboring state. Arguing that they are entitled to the benefits is a stretch, but let’s focus mainly on what the union president had to say. He seemed to suggest that if the county doesn’t agree to these extra benefits that other deputy sheriffs might not be willing to take action in a future, dangerous situation. Am I the only one appalled by that suggestion?